Laundry is one of the most annoying daily tasks we have to do as adults, so the idea of simplifying that task is a tried and true startup idea that has seen many versions over the years. And because it is such an annoying task that should be simple, we thought of doing an update of a previous article, and list out all of the laundry startups in Malaysia, and what each of them does to help simplify this chore—usually for a price, of course. We’re not including laundromats on this list (for the sake of brevity). Instead, we’re looking for solutions where you aren’t tied to opening hours, or even those that allow you to enjoy their services without having to leave the house. Perhaps one of the most interesting features to have come from the rise of startups, laundry lockers allow Malaysians to drop their dirty clothes into a locker, and come back to freshly laundered clothes. eziPOD‘s laundry dropoff and pickup app utilises QR codes and an e-wallet on its platform. Its patented technology powered by Box24. The app will notify users once their laundry is ready to collect, though it will usually take approximately 2 days for laundry to be done. The lockers are currently available in 16 locations, including malls, condominiums, and offices. Areas they service include Cyberjaya, Cheras, Puchong and mostly Kuala Lumpur. The lockers are fully automatic, and the team barcodes and photographs each item to reduce instances of washing mixups. 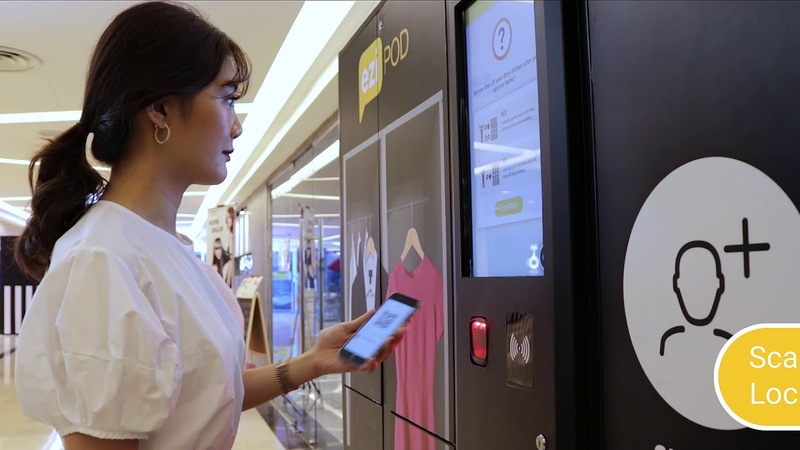 Dobybox promises fresh laundry to Malaysians within 48 hours, after users lock it with any 4-digit code of their choice. Services start at RM6.00 per kilogram for normal washes. The idea is to put up Dobybox lockers across buildings or residential apartments which, they think, would help increase the value to the tenants there, while also opening up opportunities for Dobybox to build a set of regular customers. For now, service areas include Cyberjaya and KL. To compete with the growing rise of coin-based laundromats, Mama Jo came up with the Ebox concept which took 1 year to perfect. Besides just clothes, carpets and drapery, Mama Jo also offers cleaning for handbags and leather as well. Mama Jo also utilises a 4-digit code during input of laundry, and doesn’t require an app. Instead, the laundromat will communicate with you via SMS or email, including payment details. If you’d rather convey specific instructions to your laundromat, or simply do not have laundry lockers around you, then the tried and true laundry pickup and delivery businesses are still around. Most of these services range around the Klang Vally area. Fresh Press laundry does free pickups and deliveries to your doorstep, and can get your laundry in 24 hours, and dry cleaning within 48 hours. Wash and folds go at RM4.50 per kilogram. It is available from 8 am to 11 pm daily. Service Area: Kuala Lumpur & Petaling Jaya. Mama Wosh brands itself as a premium cleaning service, and offers everything from free pickups, same-day or next-day deliveries, 7-day operational hours. The prices are also approximately RM6 per kilogramme for most of the services. This Malaysian startup curates a list of laundromat partners that users can choose from, because they think that users will want to know who exactlya are washing their clothes, and can then pick and choose the ones that they like. Pressto has been established in Spain since 1994, and has since come to Malaysia to offer deliveries since 2006. It uses ecologically freindly equipment imported from Europe. This service requires you to physically be there for the drivers to give instructions to the drivers. On the upside though, this large-scale business seems able to deal with most garment types and stubborn stains. Available locations are available upon inquiry. One of the interesting features of WashHouse is that it states that it can get laundry delivered to you by the next business day, and can even attempt to accomodate faster speeds. Free pickups and deliveries within Kuala Lumpur. Wash and folds are available for RM3.50 per kilogram, and full prices are available here. Service areas: Kuala Lumpur, Bangsar, KL Sentral, Mont Kiara, Sri Hartamas, Damansara Heights and KLCC. This SS2-based traditional laundromat does laundry for both individuals, and for services like massage centers, spas, barbers and gyms. Besides offering walk-in cleaning, this laundromat also does laundry pickups, as long as it’s above 5kg. Service Area: Kelana Jaya, SS2, Sea Park, Jaya One, Damansara Perdana, Mont Kiara, Sri Hartamas. This pickup service has a strong sense of convenience and hopes to stand apart by creating an app that will help with the whole process. It promises to get laundry delivered to your doorstep within 48 hours, using eco-friendly detergents and processes during the wash itself. The app also allows you to schedule when you’d want your laundry to be delivered. In fact, the app allows you to determine the type of detergent you want to use, or just decide whether on the heaviness of the detergent, and whether it’s scented. The app is available on Google Play here. LaundryZone has been in the industry for 6 years, and has even built a niche as a laundry service for Malaysian airlines. They are also the sole distributor of Profez Clean products for the state of Negeri Sembilan. A basic load to machine wash can go for RM4.00 per kilogram.